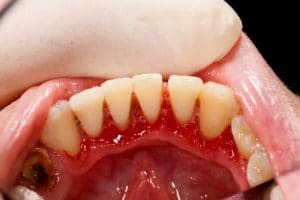 A blog looking at gingivitis and treatment. Visiting the dentist is often not the most enjoyable experience and patients can often be left confused with the various dental terms that are discussed. One of the most common dental problems is gum disease, which is a general term used to describe the condition of gingivitis. This blog will aim to provide a user friendly guide to gingivitis and explain why it occurs and how it can be treated. Gingivitis refers to inflammation of the gums. This inflammation is caused by a build-up of plaque on teeth. Plaque contains bacteria and some of these bacteria can be harmful and leave your gums inflamed and sore. Gingivitis is often caused by poor oral hygiene and a failure to remove the plaque during tooth brushing. There are also a lot of risk Factors which can leave you more susceptible to developing gingivitis including: smoking, poor diet, diabetes and stress. Healthy gums should be firm and pink but if you have gingivitis your gums can quite often be inflamed, red and bleed after brushing. In some cases, gingivitis maybe symptomless and therefore it is very important to regularly attend check-ups with your dentist, to ensure your gums are healthy. Treatment for gingivitis will first and foremost be adopting a good oral hygiene routine. This will many include, flossing and using mouthwash in addition to your usual tooth brushing. Your dentist should advise you on how your oral hygiene routine could improve. Your dentist is also likely to suggest that you have a scale and polish, which aims to remove the build up of plaque from your teeth. If gingivitis is left untreated, it can develop into periodontitis. This is a serious condition whereby the tissues that surround and hold your teeth in place can be affected. This form of gum disease is serious and can ultimately lead to tooth loss. It is therefore critically important that gum disease is treated in the early stages by your dentist to prevent such consequences. Unfortunately, a lot of my client’s have had undiagnosed gum disease which in turn has developed into periodontitis. This has left a number of my clients with missing teeth and teeth that will needed to be extracted in the future. My advice, as a Dental Negligence Solicitor is to attend your dentist regularly for advice and treatment to prevent the worse from happening. Finally, if you have any concerns that any issues with gum disease are not being dealt with correctly then please contact us.